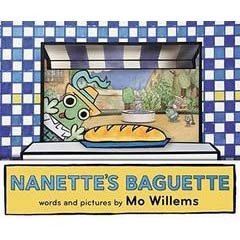 From Mo Willems, the multi award-winning creator of the Pigeon series and the Knuffle Bunny trilogy, comes a hilarious new tongue-twister read-aloud about a little girl, Nanette, on a mission to buy a baguette. It’s Nanette’s very first solo trip to the bakery. But will Nanette get the baguette from baker Juliette? Or will Nanette soon be beset with regret? Set in a meticulously handcrafted-paper-modelled French village, the uniquely vibrant laugh-out-loud world of Nanette’s Baguette may be Mo’s best creation yet. Get set to “crack” into an irresistible tale you won’t soon forget!